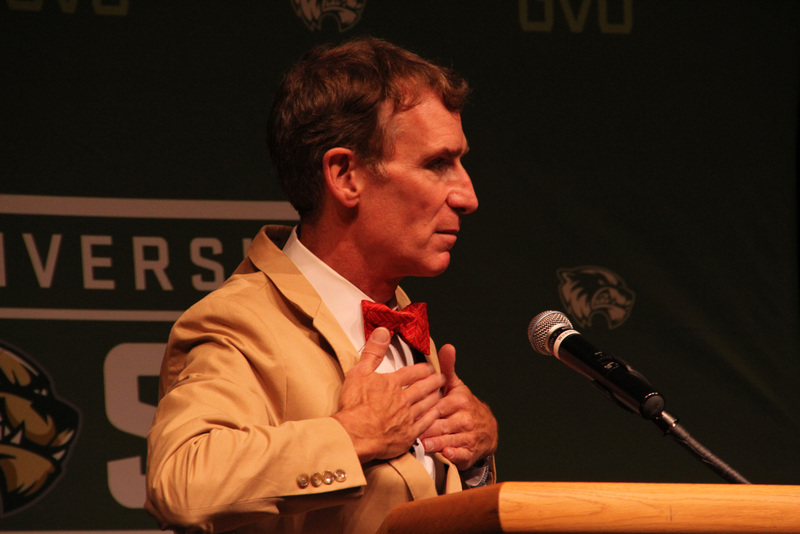 Last week I told the kids that Bill Nye was coming to UVU. “AWESOME! Can we come too?” The presentation would start at noon on a school day, and end around three. What would a good mother do? I reasoned that lots of moms take their kids out of school for dental appointments, and Bill Nye is far less available than your typical dentist. Besides, in the words of Mark Twain, “Never let schooling get in the way of education.” The kids’ dad says that social interaction is the most important part of school, and hey, how often do you get to interact socially with Bill Nye? Us with Bill Nye! Credit Torsten Bangerter for the pic. He talked about some rad sundials, including the first interplanetary sundial on Mars. There they’d noticed the different colors of shadows and how they change depending on the composition of the atmosphere. He even gave us three awesome new words: cerulescence, xanthodescence, and arangiadescence to denote the different tinges of these shadows. (Oh man, Bill Nye just inspired a new emo-folk-geeky band name for me: “Singing Cerulescence”) Then he talked about the composition of the Earth’s atmosphere and how CO2 levels are up, which segued nicely to the main topic: climate change. Several students got up and left when they realized that’s what he was talking about. Granted, it could have been time for their classes, but the trickle was just slow and prolonged enough that I suspect it had more to do with a belief that global warming is a matter of political opinion — in Orem, Utah, many people tow the hard-right line. If Bill Nye says the world is getting warmer because of human influence, and Glenn Beck says that’s bunk, who are you going to believe, and why? The long term data are clear: temperatures are going up. Even if you don’t think this is humankind’s fault, if trends continue as they have over the past hundred years or so, global warming will significantly affect us. The question left is whether and how we can take the reigns given the complexity of measuring the effectiveness of our efforts (GreenSun was my effort at one point, but aside from the initial design work, we were never able to really get it rolling). It’ll take some serious number crunching to sort out whether or not we can bring things into balance again. Speaking of which, Bill Nye brought up a rather interesting point during the Q&A session: apparently, ALGEBRA is the key to keeping kids interested in science. Kids’ interests are sparked in elementary school experiments, but if they never learn enough math to measure results and make predictions, they won’t succeed in science. Interesting stuff. To do: overcome fear of trig and calculus before my kids start asking me about it! Also, Nye referred frequently to The Planetary Society and the things they’re doing there. It’d be fun to join and support the cause, and get a plush waterbear! He had some really interesting comments regarding space travel, getting more humans there, and “the golden age of robots” that are helping us learn more about other planets. Anyway. Thanks to the UVU Student Association for bringing in such an awesome speaker, and thank you, Torsten Bangerter, for this Bill Nye + Family photo. Finally, thanks to Bill Nye for being awesome as always. Poor guy seemed a bit tired by the time we reached him, but that’s understandable: changing the world is hard work.